Ready for this? Today isn't just Valentine's Day. It's also our wedding anniversary. (Seventeenth, if you're keeping score at home.) I know, that sounds a bit like a stunt that's too cute by half. To be sure, there are advantages and disadvantages to combining these two events into one super-romantic day. One benefit to a Valentine anniversary is that there's no danger of forgetting either occasion. The downside is that it can be hard to get a dinner reservation on "amateur night." But we don't mind. 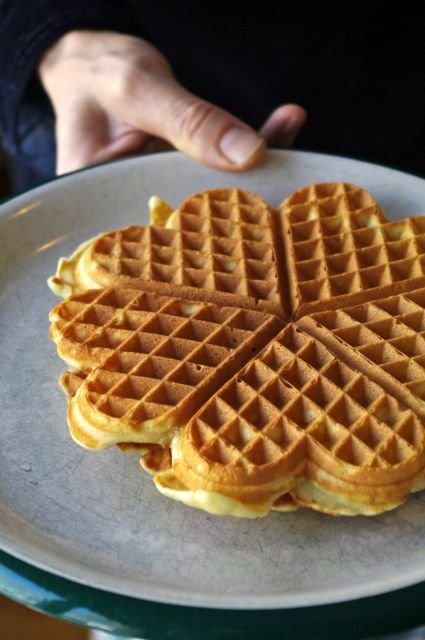 We hang out at home, feeling smug about how we have made this "Hallmark holiday" our own, and eat heart-shaped waffles. "That it isn't about the (insert #) anniversary at all, but about all the unremarkable years that Hallmark doesn't even make a card for." Happy Anniversary! The waffles look yummy - maybe you should start a foodie blog? !